Ebonyi State University (#EBSU) has released their 2018/2019 Supplementary Admission List, read the blow article carefully to see all producer on how to Check your admission status. 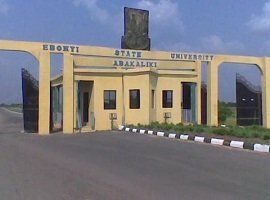 This is to inform all the candidates that applied for admission into the Ebonyi State University (EBSU) for the 2018/2019 academic session, but don’t have their names included in the EBSU 1st Admission list that the supplementary admission list is out. How to Check EBSU Supplementary Admission List. Go to EBSU admission status checking portal at https://www.ebsu.edu.ng/app/admissions/adm_status_default_page. See also: EBSU Acceptance Fee Payment & Registration Procedure for Newly Admitted Candidates – 2018/2019. Successfully admitted candidates are to ACCEPT or REJECT the offer on JAMB CAPS portal – How to Reject/Accept Your Admission on JAMB CAPS. Congratulations to all the candidates that made it to EBSU supplementary admission list.